Hello and welcome to Day #4 of Chocolate and Honey Theme Week. 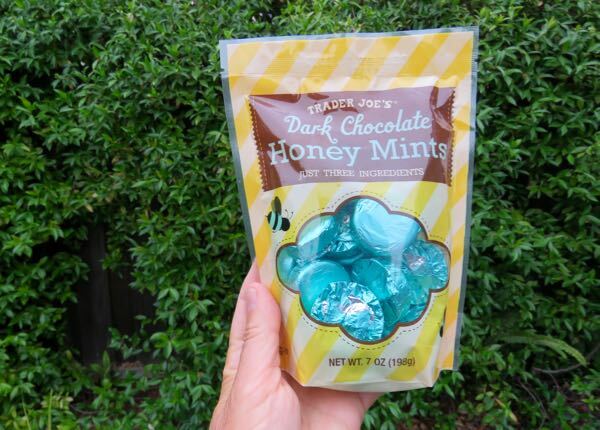 Today's sweet, refreshing Dark Chocolate Honey Mints from Trader Joe's (Monrovia, CA) had only three ingredients: honey, chocolate liquor and peppermint oil. Each individually-wrapped round was filled with a soft, ivory-colored, natural tasting honey and mint center and coated in dark chocolate. 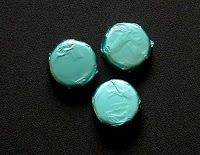 These mints (with a slightly spicy, rich dark chocolate aroma) had a honey sweet beginning and a slightly bittersweet finish. 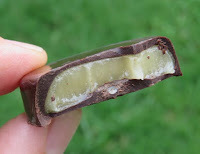 A 3-piece serving satisfied a hankering for something sweet in a relatively healthy way.